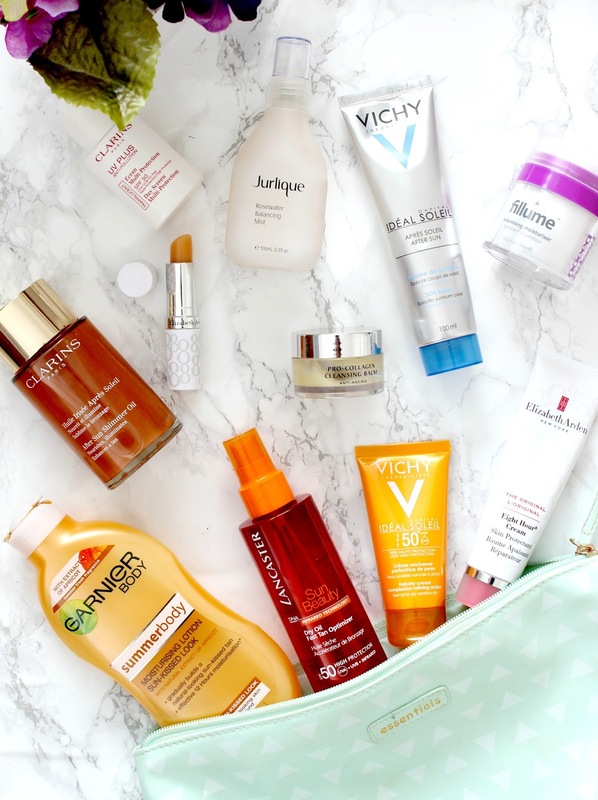 As you're reading this, I'm currently soaking up the sun on my holiday in Greece but as I'm writing this before I go, I thought it would be appropriate to show you all the skincare goodies I'm taking along with me! I always pack waayyy too many beauty products when I go away on holiday (there's no wonder my case is always so heavy) but there's so many essentials needed when you're going to be out in the sun for long periods of time. First up are a few basic skincare essentials - a cleanser, toner and moisturiser. The Elemis Pro Collagen Cleansing balm has been a favourite of mine for a couple of years now and I wouldn't go away anywhere without it. It leaves my skin feeling nourished which is important after a day in the sun and it removes every last bit of my makeup with ease. I'm also taking the Jurlique Rosewater Balancing Mist as this tones the skin and also doubles up as a cooling face spritz if my skin is feeling slightly sensitive. I always like to have something to spritz my face with when I'm out in the sun and this will be perfect. Finally, I'll also be taking the Indeed Labs Fillume Volumising Moisturiser which is my current favourite. I love the packaging (you press the top of the tub down and just the right about of moisturiser comes out) and because it contains hyularonic acid, it makes my skin feel hydrated, plumped and soft. Next up is the most important one when you're going on holiday - sunscreen. I'd rather be safe than sorry when it comes to the sun and because my skin is extremely sensitive, I tend to wear factor 50 to prevent me getting burnt. I got really badly burnt in Tenerife a couple of years ago after wearing factor 15 all day so I've been a pretty cautious carol in the sun since then. The sunscreens I'm using this year include Lancaster Dry Oil Fast Tan Optimizer, Vichy Idealia Soleil Velvety Cream and Clarins Day Screen Multi-Protection, all of which are factor 50. I'm also taking my Elizabeth Arden SPF15 lip balm from the Eight Hour range to ensure my lips don't burn! I've never tried the brand Lancaster before but I've heard great things about it and I love that this particular product helps to emphasize a tan, despite the high factor. The Vichy Velvety Cream is a product I've used before and I absolutely love it - it's perfect for using on my face as its a sunscreen and skincare product in one. It's very moisturising on my skin, makes my skin feel smooth and it smells amazing too! Finally, the Clarins Day Screen Multi-Protection is another product I'm yet to try but I love Clarins products and this cute little bottle is perfect for popping in my beach bag for on the go touch ups! Another holiday essential is after sun and the one I'm taking away this year is the Vichy After Sun SOS Balm*. I've never tried this before but I'm a big fan of Vichy so I'm sure I'll love it as it promises to provide up to 8 hours hydration and leave the skin feeling relieved and cool. Another product that is always a good one to have when skin is feeling a bit sensitive is the Elizabeth Arden Eight Hour Cream thanks to its many uses. It can be used to relieve chapped, cracked or dry skin as well as being soothing and calming on redness or minor skin irritations. Finally, a couple of none essential skincare products I'll be taking away with me are the Garnier Summer Body Moisturising Lotion and the Clarins After Sun Shimmer Oil*. I always love to take a gradual tanner on holiday with me and the Garnier one is my favourite! It's really moisturising which helps to prolong my natural tan as well as enhance it due to the slight bit of self tan it contains. I also like to use this when I get back from my holiday to make sure my tan lasts! The Clarins After Sun Shimmer Oil is one of their new products and I'm so excited to use this on my skin before evenings out to give it a nice golden glow. As well as the beautiful iridescent shimmer it provides, it also contains hazlenut oil which nourishes and protects the skin as well as protecting it from dehydration after sun exposure! So there we have it, my holiday skin essentials. This lovely lot should help my skin be protected, hydrated, soothed, glowing and shimmery throughout my holiday! What are your holiday skin essentials? This is basically what my bag looks like when I go on vacation. Last time I had to pay the extra fee because my bag was over the weight limit- it was embarrassing lol! I agree sunscreen is the most important thing- I like to layer it. Have fun in Greece! Garnier Body Lotion is great! Love it! Also all the products from Vichy are amazing! Love the pro collagen balm! I really must must try 8 Hour Cream! Everyone loves it. I've never tried fillume but I love the Indeed Labs hyaluronic jelly, I use it every day! Have a brilliant time in Greece, can't wait to read a post about it! Hope you're having an amazing vacation - I've always wanted to go to Greece! This is a lovely line-up of skin care products, I especially love the sounds of the sunscreen that also emphasizes a tan - the best of both worlds! Really want to try the Elemis Pro Collagen Cleansing Balm. Everyone seems to love it! Hope you're having a lovely holiday, so jealous! I love the Gairner lotion, I go back to it every year! All of these Summer posts are getting me excited. The only product I have tried is the Gairner lotion and I must say I am a big fan. I love the sound of the Elemis Pro Collagen Cleansing Balm. I have heard a lot of great reviews. I might have to have a little splurge and pick this product up. Loved reading all the skincare goodies you will be bringing on your trip. I definitely want to try that Elemis cleansing balm as I have been on the hunt for a good night cleanser. Hope you have an amazing holiday in Greece! The Garnier moisturizing lotion looks really interesting! During the summer, I love using the Dove body lotion that helps getting a gradual and natural looking tan. It does work, and makes the skin look healthy and not orange, as some fake tans do! The 8 hour cream and lipstick are amazing i have used both. Amazing! I love the Garnier moisturising lotion.